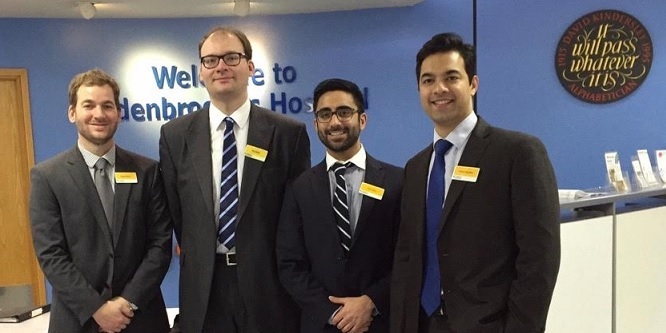 Aditya Nigudkar, Kit Hobbs, Dante Palazzo and Neil Dubey are the four group members of the Addenbrooke’s Hospital Global Consulting Project (GCP). We’re very excited to utilise our diverse backgrounds and resources at Cambridge Judge Business School (CJBS) to improve our local healthcare systems. Although the specifics of our project are confidential, we are performing an operational analysis of Addenbrooke’s Hospital and providing recommendations to deliver better healthcare for patients while saving the healthcare system money. Since this is our first blog update, we want to introduce the members of our team and highlight key individuals that our helping us on our GCP journey. Our main client contact is Director of Strategy at Addenbrooke’s Hospital, Lawrence Ashelford. We are lucky to work with two CJBS faculty members on this project. Our faculty supervisor is Prof. Feryal Erhun, who brings extensive research in the American healthcare system at Stanford University School of Medicine. Prof. Stefan Scholtes is on sabbatical as an Operations Consultant at Addenbrooke’s Hospital and has been working with us to develop this project. Additionally, we have a Michael Freeman, a PhD student at CJBS who is assisting with quantitative analysis and Daniella Cossio-Martinez, a research fellow at Addenbrooke’s Hospital who is doing qualitative research on different hospitals and their specialty services. Our team of students is quite unique in our backgrounds. Aditya Nigudkar brings industry experience as Partner at InterMedics, his family business, which focuses on healthcare solutions in India. Neil Dubey is an American medical student from George Washington University who is interested in Hospital Administration and Quality Improvement. Our other team members come from backgrounds outside of healthcare, but are passionate about the opportunity to make a difference in the Cambridge community. Dante Palazzo has a decade of experience working in Financial Analysis and Strategic Planning at Coca Cola in Brazil. Kit Hobbs is an offshore corporate lawyer, who is coming back to Cambridge after doing his undergraduate studies here in Linguistics. Even though we are based in Cambridge, we are travelling out of town soon to do some field work for our project and we’ll report on that soon.